Our contributor, Lauren Kapeluck of EllenJay Events, is back with a delicious new recipe…. With the temperatures getting hotter and summer quickly approaching I thought it would be fun to reminisce back to my childhood with this month’s cupcake recipe. I have never been much of a soda drinker but on those rare occasions when I do indulge, my beverage of choice is Root Beer, probably because of the intense sugary vanilla flavor. As a kid, my favorite cold treat was a Root Beer Float. Drinking an ice cold root beer poured over vanilla ice cream was the perfect way to end a hard day of playing outside. 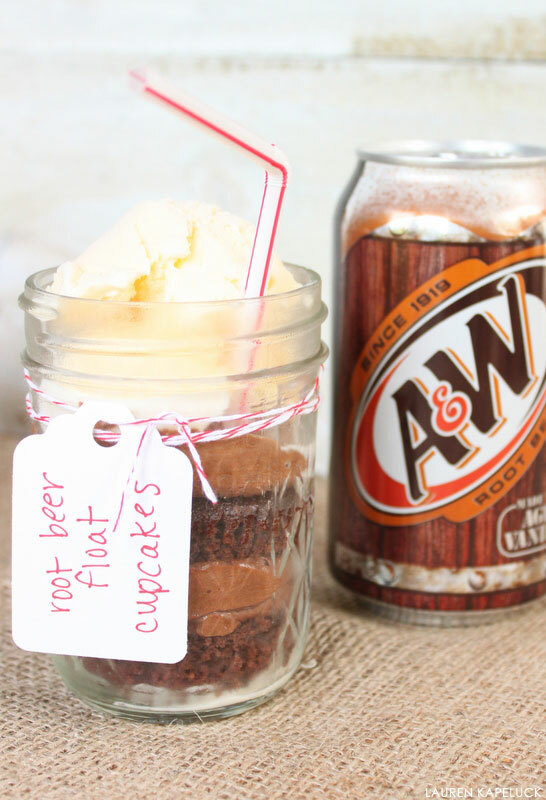 I have recreated this nostalgic treat as a Root Beer Float Cupcake for you to enjoy this summer! These cupcakes are a traditional chocolate enhanced with root beer flavor in both the cake and frosting. My all time favorite root beer is A&W, but feel free to use whatever brand you like best in this recipe. You may remember the Strawberry Lemonade Cupcakes I created last summer. 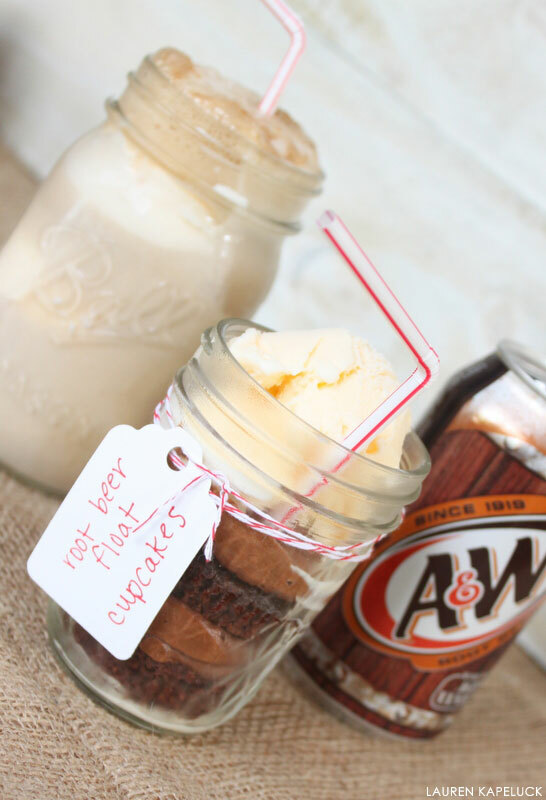 Well since they were such a hit I thought I would bring back the cupcake in a jar idea for these Root Beer Float Cupcakes. Layers of cake and icing, it doesn’t get much better than that right? Well, this year it does because these cupcakes are topped off with a scoop of vanilla ice cream. After all, you can’t have a float without the ice cream, now can you? The thing I love most about these cupcakes, besides how cute they are is that they are portable and storable. Just pop on the lid and take them with you to a summer picnic or party. Grab a container of ice cream along the way and add a scoop to these cakes right before serving. 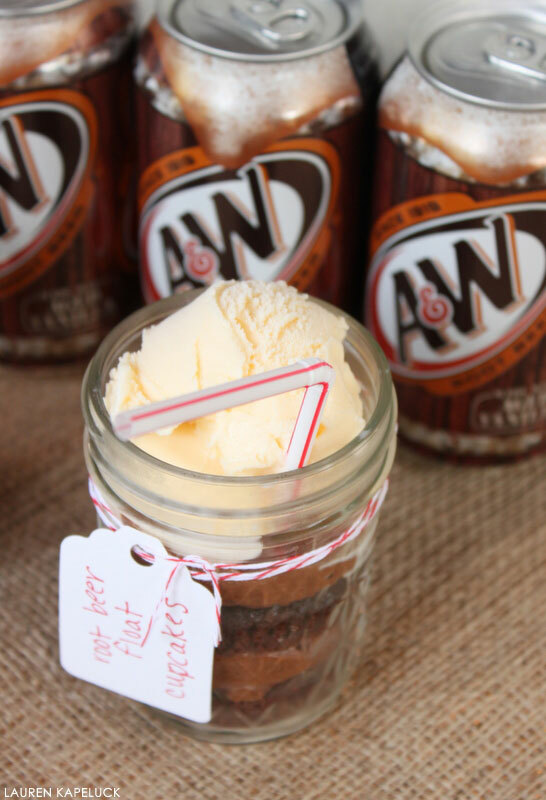 O r you can assemble your cakes in the jar, add a scoop of ice cream on top and seal tight with the lid. Pop them in your freezer and pull out a jar when you need to satisfy that sweet craving and don’t feel like baking. These cakes are also great to make ahead of time if you are planning for an upcoming party. By assembling the cakes and ice cream in the sealed jar you can have individual ice cream cakes that can be brought out when it’s dessert time! In large bowl mix together dry ingredients: flour, baking soda and salt. In saucepan over medium heat combine butter, cocoa powder, root beer and root beer extract and stir until smooth and combined. Remove from heat. Add granulated sugar and brown sugar to cocoa mixture and mix well. Beat eggs and add to cocoa mixture. Add the cocoa mixture to the dry mixture and stir until combined. There will be a few lumps and that is ok.
Bake for 15-17 minutes or until toothpick inserted in center comes out clean. Once cupcakes are completely cool, top with Chocolate Root Beer Frosting. In bowl of stand mixer, cream butter. Add cocoa powder, melted chocolate, Root Beer and Root Beer extract and mix until combined. Gradually add confectioner’s sugar and continue mixing scraping down sides of bowl as needed. Place the icing in a piping bag and cut off the tip to frost the cupcakes. Slice cupcake in half with serrated knife. You will need one cupcake for each jar. Place half a cupcake in the bottom of the jar and add a dollop of icing on top. Place the other half of the cupcake on top and add another dollop of icing. Add a scoop of vanilla ice cream on top right before serving. Garnish with a plastic straw. I hope you enjoy this spin off of the classic Root Beer Float! I wonder if you caould make the cupcakes with white cake mix and a can of root beer instead of all the other ingredients. I just baked these cupcakes and they are delicious. I didn’t have root beer extract (I don’t think they sell that in Austria) so they don’t taste a lot like root beer but it’s still nice. I only made half the amount of cream which was a mistake as the cream is delicious as well. I used only 1 cup of sugar for it though and definitely won’t add the second one, I think it is sweet enough already. These sound and look amazing! I found them on Pinterest. I plan to try them soon. Thank you for sharing. I have tried theses, they are Devine! Hi Anita. I’m sorry to hear that you had trouble with this recipe. There are some culprits that can cause cupcake liners to stick. Generally, cupcakes will stick to the wrapper if it is still warm. It is best to wait until the cupcake is completely cool before peeling. Overbaking the cupcake can also cause this to happen. And sometimes the paper liner itself can cause trouble. If all else fails, you can always bake a cupcake directly in the muffin tin, well buttered or coated with non-stick cooking spray. I hope these insights help for next time.